Who can you turn to for help? 'WHERE IS MY SON?' is the poignant story of Owen, a carpenter and his little son Matthew. It describes their fight to stay together in the face of a legal system that is indifferent - even hostile. The struggle moves from the family home to police stations, courtrooms and hospital beds to its unforgettable conclusion. THIS BOOK could well be described as a dismally- recognisable everyday story of modern menfolk. As the author puts it: "This is a true story. Names and places and people have been changed". So, a thinly disguised autobiography written almost as a novel. "Owen Sheridan", peripatetic construction worker from an Irish background, settles in London and marries an Irish solicitor. 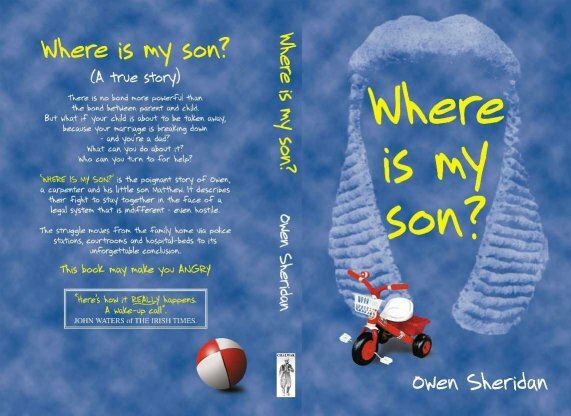 What follows is a personal tale of self-discovery that takes him through problems in the marriage, fatherhood, separation, the legal system and family courts and finally, a life apart from his son. Set partly in London and Ireland, it resembles a Celtic oral history - with characters, incident, anec- dotes, aphorisms and even a little piece of music included. But what comes through most of all is an initial incomprehension, followed by a powerful sense of anger, pain and disbelief at the injustices which occur in his life. Not least over the issue of domestic violence and the many ways it can be misused and misinterpreted under the law. He particularly resents the way in which he has been forcibly estranged from the son he clearly loves very much. "I had been led by the nose," he writes, "into the grim world of dispossessed dads - and by the very lawyers who were supposed to be fighting for me." Sheridan is no Everyman and certainly doesn't make any claim to be. But many fathers facing marital difficulties could read this account and share a strong sense of familiarity, recognition and sympathy.